All of the readings in this Sunday’s Mass underscore one basic theme — God forgives. You’d have to be blind to miss the message. In the reading from Exodus, we see the Israelites just after God liberated Israel from slavery in Egypt. Almost immediately, they turn from God to worship false idols. And God forgives them. In the reading from St. Paul’s first letter to Timothy, Paul recounts how he was a blasphemer and a persecutor, the foremost of sinners. And yet in Christ he has been forgiven, even to the point of being one of His Apostles. And in our gospel reading from Luke, we find perhaps the greatest story of forgiveness, the parable of the Prodigal Son. 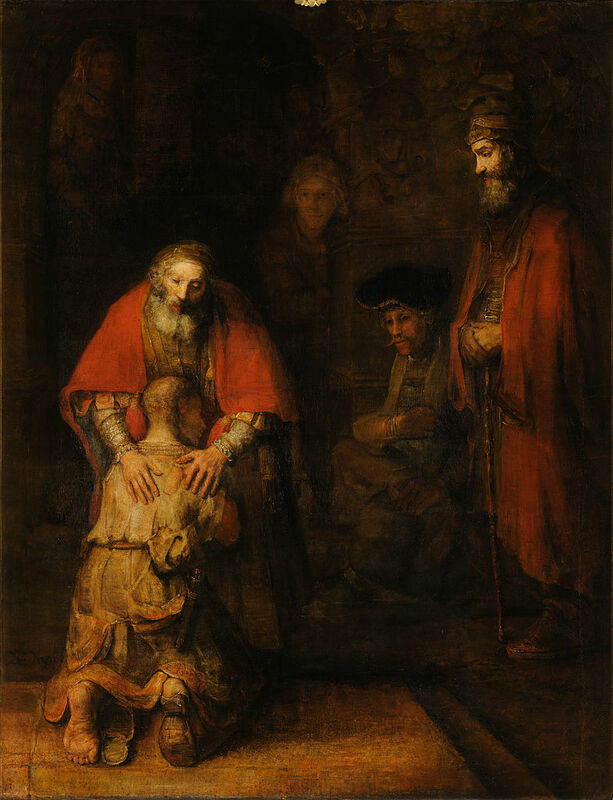 In this story Jesus tells as a metaphor of how eager God is to forgive the repentant sinner, the father runs to his son, embraces him and kisses him. He throws a huge party! God doesn’t just forgive, He forgives lavishly, and with abundance. You’d have to be blind to miss the message. Sadly, so many are blind. So many present a Christianity without redemption, a God without mercy, a Christ without forgiveness. Such a Christ is no Christ at all. Earlier this week I had a brief exchange with a woman who had given Christianity a try and found it left a bad taste in her mouth. She’s not Catholic, and I did not ask the denomination of the church she attended. But she didn’t find Christ there, because she didn’t find forgiveness. I tried my best to assure this young woman that what she heard preached in that church was not Christianity, but something else. Let’s go ahead and call it what it is — heresy. Christ came for one reason and one reason only — to reconcile sinners to the Father. He offers forgiveness. A Christ without forgiveness is no Christ at all. If you are staying away from the Church because you are afraid you will be condemned for the actions of your past, have no fear. The Church is full of sinners — some of them reformed, many still working on it. The one thing every Christian has in common is the realization that we are sinners in need of forgiveness. But we must also realize, and trust in the fact, that God is eager to forgive. How many Catholics avoid the confessional because they are afraid to face condemnation? In fact, what is offered in the sacrament is the opposite of condemnation — it is redemption! We go to confession in order to turn the sorrow we feel over our sins into rejoicing! Jesus tells us, “there will be more joy in heaven over one sinner who repents than over ninety-nine righteous people who have no need of repentance” (Lk 5:7). The only way God won’t forgive us if it we don’t ask. The only limit on His mercy is our free will. He wants to bring us to Himself, but He will not force us. So if you feel shame over your sin, let it draw you to the Church, not away from it! For it is in the Catholic Church were you will encounter Christ — the real Christ — who longs to draw you up to Himself on the cross, where He bears each one of your sins, so that you may rise to a new and holy life in Him.